Our current astrology involves two near-simultaneous conjunctions. Sunday at 1:53 pm EDT (17:53 UTC), the Sun conjoined Mercury. This is the midpoint of Mercury retrograde, which will last until April 15. The second conjunction takes place Monday at 11:44 am EDT (15:44 UTC), which is Mars aligning with Saturn in Capricorn. NASA’s Astronomy Picture of the Day website has been running April Fool jokes pretty much consistently for around 15 years. This is today’s specimen, titled ‘I Brought You the Moon’. 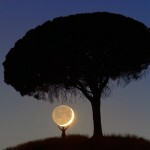 Photo taken in a single exposure in Valladolid, Spain, by Fernando Cabrerizo. The Libra Full Moon passed quietly enough on Saturday, without any major shakeups (at least so far) on the double holiday weekend (both Easter and Passover). 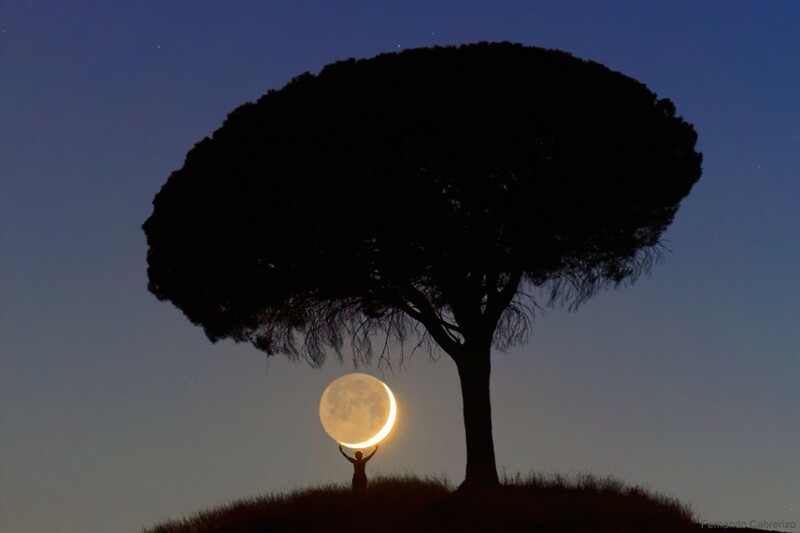 Mercury-Sun conjunction in Aries. To the right is Chiron in the last degree of Pisces; and to the left is the Uranus-Eris conjunction in Aries, and Venus in Taurus. Chart by Io Sprite animation program, a product of Time Cycles Research. Our current astrology involves two near-simultaneous conjunctions. Sunday at 1:53 pm EDT (17:53 UTC), the Sun conjoined Mercury. This is the midpoint of Mercury retrograde, which will last until April 15. 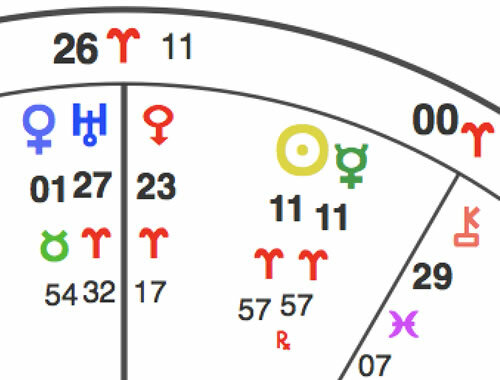 In the accompanying chart, note that Venus is also newly in Taurus, and Chiron is in the very last degree of Pisces. I wrote about Chiron ingressing Aries in Thursday night’s edition. That takes place on April 17, two days after Mercury stations direct. I’ve seen that the interior conjunction of Mercury and the Sun — the moment when Mercury passes directly between the Earth and the Sun — provides some relief to the negative effects of the retrograde. In the midst of much other activity, it can be a moment of transparency, and some positive message or idea that manifests in a tangible way. The second conjunction takes place Monday at 11:44 am EDT (15:44 UTC), which is Mars aligning with Saturn in Capricorn. This is the one and only conjunction of Mars and Saturn while Saturn is in Capricorn; that makes it a once-in-29-years event. The next Mars-Saturn conjunction will be in Aquarius. The Mars-Saturn conjunction in Capricorn, exact one day out of every 29 years. Above you can see Pluto in Capricorn; below, Vesta conjunct Pholus. Both Mars and Saturn have significant dignity in Capricorn. Saturn is the sign ruler, and Mars is exalted in Capricorn. I’ve been studying this conjunction for weeks, and to me it seems like a point of contact of some kind — a joining of forces for some bona fide purpose. I suggest you take advantage of this however you can, since this is basically an event that takes place one day out of 10,585 days. The theme seems to be 1) business and 2) family. I would recommend Monday as the day to attempt the impossible: reach for the job you never thought you could get, resolve the issue you assumed was insurmountable, solve the problem you never thought would give an inch, and so on. There’s a little extra magic in the air with Chiron in the mystical last degree of Pisces — that is, the last degree of the zodiac. 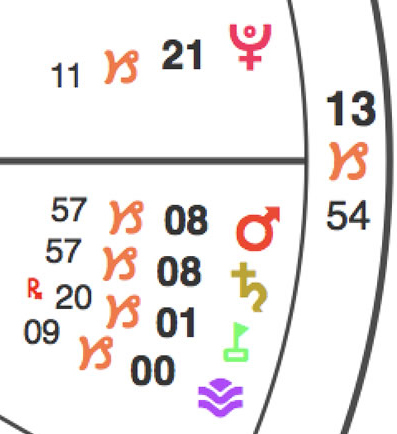 One other point of news from Capricorn while I’ve got your attention: Vesta has just arrived, and it’s about to form a conjunction with Pholus, the second centaur planet. Vesta is about service and devotion. Pholus releases things from containment. We could do well with more of the Marjory Stoneman Douglas High School spirit: let’s get the job done now, no matter how difficult it may seem.